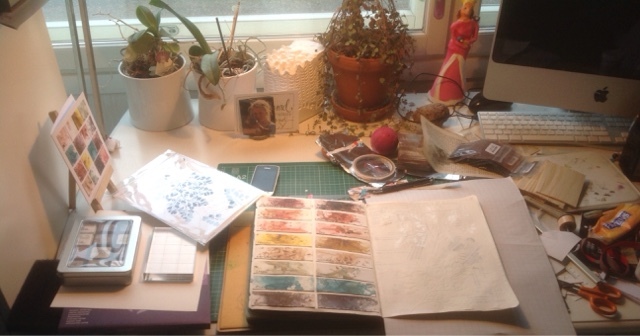 My desk is overtaken by experiments related to the new Paperartsy challenge (pigment powders). I know I should be finishing a DT thing for next week, but I want to try this out first. I made a colour swatch for Bister powders, leftovers became a CAS card and the right side of the spread is still under work (I'm hoping to finish and post it tonight). You can maybe see the Bister bags in a pile near the keyboard. I bought a sampler pack with all the colours about a year ago from Stampinback.nl, they'll last me a decade for sure! There are also some strips of wood, I got them from my mother-in-law (already tried stamping on it, and was ok, check here). I have no idea why the dog's ball is on the desk, maybe I should through it for her to play, because now I've got to leave for work. Funny that you see something on your desk AFTER the photo is taken! The pigment powders look really interesting, I hope you enjoy the experimenting! Clever use of the left over samples to create a card. Have a lovely week.